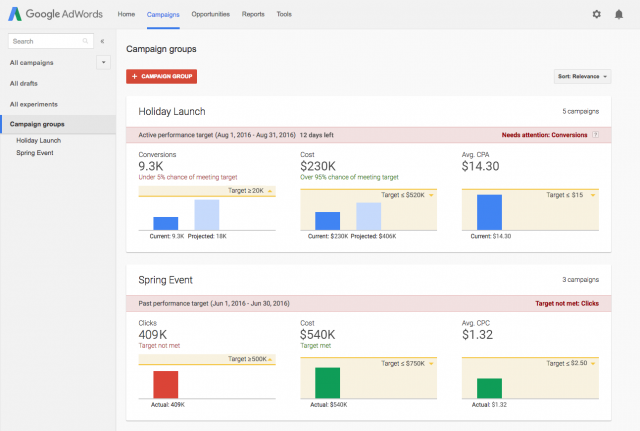 Google announced on the AdWords blog two new features to help you track your AdWords performance, campaign groups and performance targets. Jon Diorio from Google said on Google+ that he is "terribly excited" about this launch, adding "if you want to reduce the amount of time you spend monitoring and tracking performance against your goals, do go check it out." Create a campaign group: You can now package AdWords campaigns (including Video, Display, Search, and Shopping campaigns) into a single campaign group. For our holiday example, set up your YouTube and Display campaigns, select “campaign groups” from the left menu, and group those two campaigns together to create a campaign group called “Holiday Launch”. Set a performance target: Performance targets make it easier to monitor and reach your performance goals for each campaign group. Tell us how many clicks or conversions you want to receive, how much you want to spend, and what average CPC or CPA you wish to maintain. We'll then automatically show you a single view of how your campaign group is performing against those goals, and what we think you'll likely achieve by the end of the campaign period.